This is a simple drill to teach the basics of dribbling to new players. It’s a good way to introduce new moves without overwhelming them and will also help to improve the technique of the movements players already know. Every player has a basketball and lines up on the baseline. 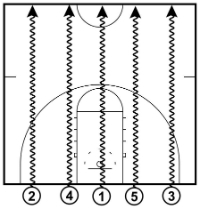 If you have more than 8 players, create two lines on the baseline instead of one. The coach will instruct the players to use different dribbling movements to dribble up to either the half-court line or full court. Tell them the dribble movement you want to be performed first, and then say ‘go’. Players must keep their heads up at all times. Once they develop good technique, focus on the players pushing off with their outside foot when making a move. Write down the dribbling moves so that you don’t forget them. I always do!